International trade moves annually trillions of dollars and represents one of the main networks of interactions between countries in the world. Along economic size, geographic distance has been recognized to shape trade interactions but its importance is currently under scrutiny. The gravity theory of trade flows is directly related with the connection probability we use in our hidden metric space models. We plan to map the world trade web according not only to geographic location but to actual aggregated barriers to international trade in the world. Here, we present the World Trade Atlas 1870–2013, a collection of annual world trade maps in which distance combines economic size and the different dimensions that affect international trade beyond mere geography. 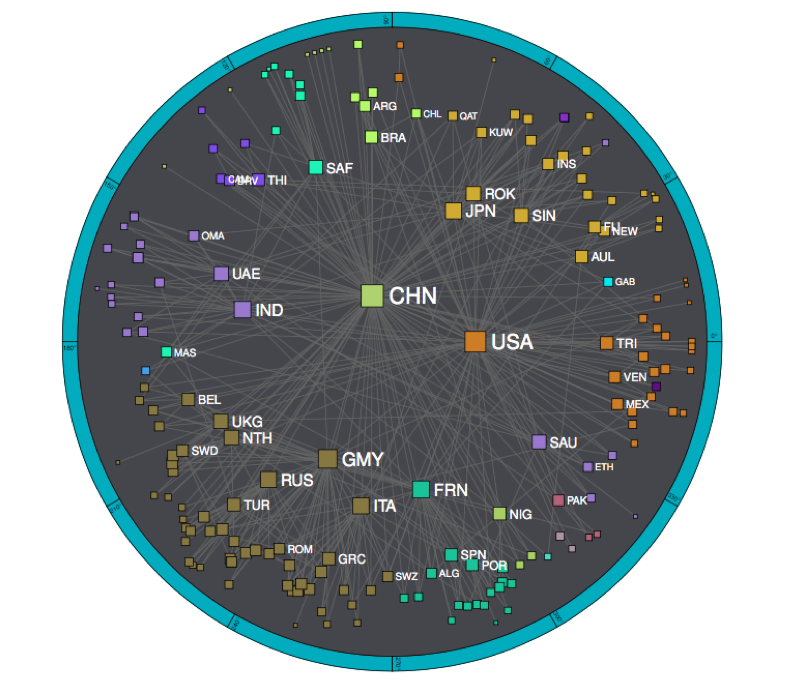 Trade distances, based on a gravity model predicting the existence of significant trade channels, are such that the closer countries are in trade space, the greater their chance of becoming connected. The atlas provides us with information regarding the long-term evolution of the international trade system and demonstrates that, in terms of trade, the world is not flat but hyperbolic, as a reflection of its complex architecture. The departure from flatness has been increasing since World War I, meaning that differences in trade distances are growing and trade networks are becoming more hierarchical. Smaller-scale economies are moving away from other countries except for the largest economies; meanwhile those large economies are increasing their chances of becoming connected worldwide. At the same time, Preferential Trade Agreements do not fit in perfectly with natural communities within the trade space and have not necessarily reduced internal trade barriers. We discuss an interpretation in terms of globalization, hierarchization, and localization; three simultaneous forces that shape the international trade system. Globalization processes are interwoven with economic structures on a worldwide scale, trade playing a central role as one of the elemental channels of interaction among countries. Despite the significance of such phenomena, measuring economic globalization still remains an open problem. More quantitative treatments could improve the understanding of globalization at the same time as helping to form a basis for comparative economic history. In this letter, we investigate the time evolution of the statistical properties of bilateral trade imbalances between countries in the trade system. We measure their cumulative probability distribution at different moments in time to discover a sudden transition around 1960 from a regime where the distribution was always represented by a steady characteristic function to a new state where the distribution dilates as time goes on. This suggests that the rule that was governing the statistical behaviour of bilateral trade imbalances until the 1960s abruptly changed to a new form persistent in the last decades. In the new regime, the figures for the different years collapse into a universal master curve when rescaled by the corresponding global value of gross domestic product. This coupling points to an increased interdependence of world economies and its onset corresponds in time with the start of the last wave of globalization. The large-scale organization of the world economies is exhibiting increasing levels of local heterogeneity and global interdependency. Understanding the relation between local and global features calls for analytical tools able to uncover the global emerging organization of the international trade network. Here we analyze the world network of bilateral trade imbalances and characterize its overall ﬂux organization, unraveling local and global high-ﬂux pathways that deﬁne the backbone of the trade system. We develop a general procedure capable to progressively ﬁlter out in a consistent and quantitative way the dominant trade channels. This procedure is completely general and can be applied to any weighted network to detect the underlying structure of transport ﬂows. The trade ﬂuxes properties of the world trade web determine a ranking of trade partnerships that highlights global interdependencies, providing information not accessible by simple local analysis. The present work provides new quantitative tools for a dynamical approach to the propagation of economic crises. Economy, and consequently trade, is a fundamental part of human social organization which, until now, has not been studied within the network modeling framework. Here we present the first, to the best of our knowledge, empirical characterization of the world trade web, that is, the network built upon the trade relationships between different countries in the world. This network displays the typical properties of complex networks, namely, scale-free degree distribution, the small-world property, a high clustering coefficient, and, in addition, degree-degree correlation between different vertices. All these properties make the world trade web a complex network, which is far from being well described through a classical random network description.